Learning how to make a good soup stock is an essential skill every cook should know. Yes, it’s super easy to just buy cans of stock or broth but nothing tastes better than a slowly-simmered stock made with the freshest ingredients. 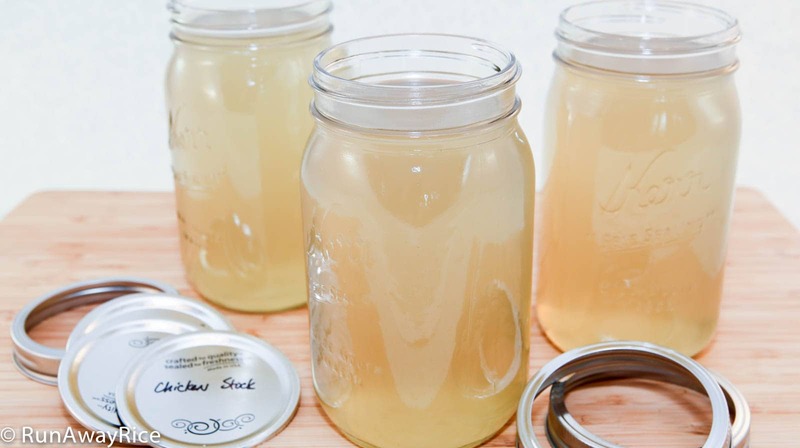 With the colder months quickly approaching, having ready-made chicken stock is really convenient when you want to quickly prepare your favorite soups, stews and other hearty comfort foods. So clear-out some room in the freezer and get ready to make a batch of this delicious chicken stock! If you can buy just chicken breast bones, these make the clearest broth. Depending on where you live, breast bones can be difficult to find. Most stores sell chicken bones which is typically the chicken carcass. The bones are often packaged with the neck, skin and fatty parts. Discard these and don’t use them in making the chicken stock. Neck bones cloud the stock and the fat and skin will make the stock really oily. Rinsing the bones with hot water is key. This process washes off any residual blood, bits of loose meat or whatever debris is clinging to the chicken. Parboiling the chicken is a similar and effective technique but I find rinsing much easier as I don’t have to lift a heavy stockpot and pour out boiling water. Skim, skim, skim and remove the foam or scum that floats to the top of the broth. These are impurities which will cloud the stock. Be diligent about skimming the stock and you’ll be rewarded with beautifully clear stock. Strain the broth using a fine sieve. If you don’t have a fine sieve, use a paper towel or coffee filter with your existing sieve. Both do a great job with catching the impurities. Stock too oily? Refrigerate the stock overnight. In the morning, use a spoon to scoop off the fat from the top and discard. Instant calorie savings! Don’t over-salt your stock. You’ll most likely add more salt and other spices to it when using it to make other dishes. The stock can be refrigerated for up to 1 week. Save the stock for later use by pouring into it into smaller containers or re-sealable plastic bags and freezing. (Make sure to leave some room for the stock to expand when frozen.) The stock can be frozen for up to 1-year. If you enjoy this recipe, you may also like: Rich and Flavorful Pork Stock (Nuoc Leo). Trim off any remaining fat and skin from the chicken bones and discard. Fill a large stockpot with hot water and add 1 Tbsp salt. Add the chicken bones into the pot. Swirl each of the chicken bones in the hot water for a few seconds. Allow the bones to soak for 5 minutes. Remove the bones and drain the dirty water. Rinse the stockpot. Repeat the process of rinsing and then soaking the bones in the hot water one more time. Remove the bones and drain the dirty water once again. Place the bones back in the stockpot and transfer to the stove. Add 30 cups of water or as much as the pot will hold leaving some room for the remaining ingredients. Cover the stockpot and cook on High Heat for approximately 20 minutes. After 20-25 minutes the stock should start to bubble. Remove the lid and gently rotate the bones. For the next 20 minutes, skim the foam off the top of the stock and discard. During this time, as soon as the broth starts to boil, reduce the heat to Low. Do not allow the stock to boil rapidly. Add the apples, carrots and radish along with the rock sugar, peppercorns and salt. Cover the pot slightly and simmer for 1 hour. Every 15 minutes, check to make sure the stock is not boiling and skim the foam from the top. After 1 hour, turn-off the heat and let cook for another 30 minutes. Remove the fruit, vegetables and chicken bones and discard. Strain the broth using a fine sieve. Oh wow, I didn’t realize that neck bones of chicken is not good to use. Thank you so much for this tip. I guess I have to buy whole chicken and save the breast bones as I have never seen anywhere that sells breast bone. How about back bones? Are they any good? Thanks for your clear instructions. Thanks for stopping by and I am glad you found this recipe helpful. Yes, if you have other options, don’t use neck bones. Back bones are just fine and I use these often. 99 Ranch Market packages back bones along with breast bones and sells them for a good low price. All breast bones are becoming more and more difficult to find. Most grocery stores don’t prepare meats on site anymore and so they don’t have bones to sell. A butcher can sell you breast bones or you can buy at a true farmer’s market. Hope that helps! Just like the way you explain things. Makes it really easy to follow. Where did you receive your culinary training from? I studied for many years under the expert instruction of a culinary master–my amazing Mom! Thank you for the kind words and your interest in my recipes. Happy Cooking!